camp11.com » News: The First Step in the Road to Peace. Please feel free to forward this to any major news media. But please include these notes, so that I don’t get a Jihad called on me in case anyone misinterprets it. 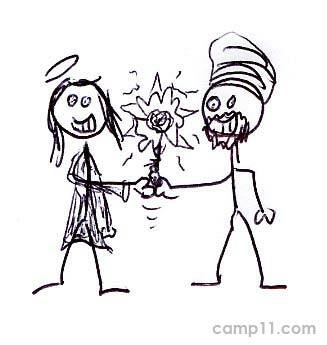 For anyone thatâ€™s having trouble interpreting my unique artistic style, this cartoon shows Christianity, Judaism, and Islam all shaking hands, getting along, and smiling. The guy on the left is Jesus Christ, heâ€™s there to represent the Christians. The weird ball of energy thing in the middle is there to represent the Jews. Since I don’t really know who or what the Jews believe in or worship, I decided to just draw the Jewish God as a glowing orb of spiritual energy, this was much easier that actually researching what the Jews are all about. The guy on the right represents Islam, Iâ€™m not saying who that is representing Islam. Instead, Iâ€™ll let you, the viewer, decide who it is, that way, you only have yourself to blame for putting the wrong face to the figure and breaking any religious laws. So, if your thinking that itâ€™s Muhammad, you are soooo in trouble. It looks to me like they are both holding a stick of dynamite with the fuse on fire ready to blow religion into eternity. Sean, what are you trying to pull here? I can assure you that this was completely unintentional… The thing extending from the Jewish ball of spiritual energy is supposed to be a sort of kinetic plasma bolt of energy extending out to shake hands with the other figures. It is not a stick of dynamite! 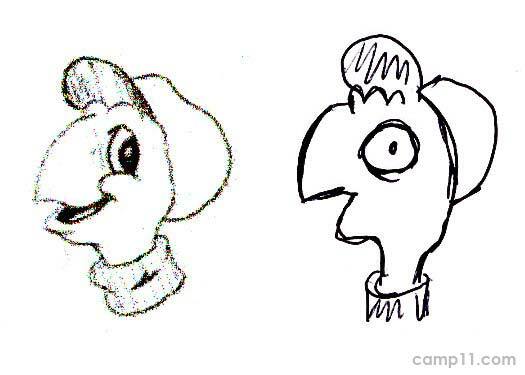 I have no idea what went wrong with this drawing… I swear, those guys at the art instruction school told me that I really have talent… I mean I filled out the form and sent it in and they got back to me saying that I really had potential to be a great artist! I mean, they wouldnâ€™t have lied to me just to get that $3000.00 tuition fee that I paid, right? Your turtle looks like a One eyed Cycloptic can opener that never blinks………… but beauty is truely in the eye of the beholder.